Franklin’s words came back to me when I learned about President Trump’s Commission on Election Integrity, which he created to back up his baseless claim that “millions” voted illegally for his opponent in 2016. Once purged from voting rolls, legitimate voters have to try and prove they are eligible, in a kind of modern version of the citizenship tests long used to keep African Americans from voting before the Voting Rights Act of 1965. 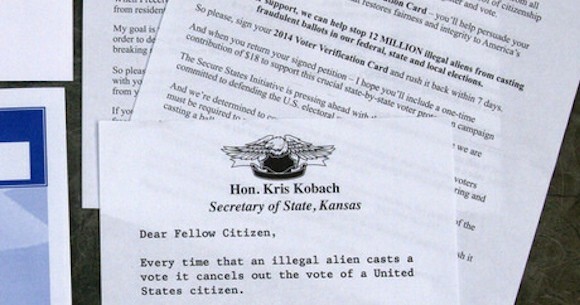 Now it looks like Kobach, with Trump’s blessing, wants to take his campaign to disenfranchise voters nationwide, and use false allegations of fraud to deny thousands upon thousands of people the right to vote, all across this land. So I have to ask, what do we lose when even one legitimate voter is denied that right? As a Native, I’m all too familiar with false allegations of voter fraud, because it’s something we face every time we win an election. In a very close 2002 U.S. Senate race in South Dakota, Native votes decided the outcome. A Senator was elected by a margin of 528 votes, all of which came from two reservations in Shannon County (now Oglala County) and Todd County, home to the Oglala and Rosebud Sioux Tribes. Of course, this was far from the truth. Yet political agents came from far and wide to back up the phony claim. They brought affidavits that already had allegations of fraud typed up, so all they needed was to find an Indian to sign one. Having secured this single affidavit, the political agents rushed to the media and to the South Dakota Attorney General’s office all bright and cheerful with their prefabbed affidavit. But there was one big problem: the person that signed their form letter never voted. But even though the South Dakota Attorney General himself stated there was never any fraud, it didn’t stop unscrupulous Republicans from repeating the tale. Then on October 30, 2004, Novak repeated the claim on CNN that “the Indians stole the election” for U.S. Senate in South Dakota in 2002. You may be wondering why, since it’s 2017, am I even bringing this up? It’s because these allegations of voter fraud, even though they were proven utterly false, still allowed South Dakota lawmakers to create laws that are now barriers to keep Natives from participating in the democratic process. This is exactly the same strategy, and the same kind of false allegation, that Kobach and his crew have used to disenfranchise minority voters, over and over, all over the United States. And political operatives like Kobach know their allegations don’t need to be even close to the truth. Because if they can get enough media coverage, the echo chamber will amplify and spread their phony story. True believers will do the dirty work, and continue to spread the lies. In South Dakota, this tactic worked so well that voter turnout on Reservations has never reached the levels seen in 2002. Recently, I chaired field hearings in Bismarck, North Dakota on voting rights for Natives during the Tribal Leaders Summit. We heard testimony from Montana, North Dakota, South Dakota and Wyoming. We discovered barriers existed in all states that decreased the number of Natives who turned out to vote. Of these, I wanted to learn more about North Dakota. In 2012, the Native voters’ turnout for the U.S. Senate race in North Dakota decided the outcome of the election. Now you need to understand that at that time, North Dakota was one of the top states in allowing its citizens to vote. If you did not have an ID with you on Election Day, a poll worker could vouch for you and you could vote. A physical address was not needed, and they also had same-day voter registration. In other words, the state made sure the law allowed all its citizens to vote. Well, when the preferred candidate of the state legislatures was defeated, the false rumor of voter fraud once again surfaced in Indian Country. So North Dakota, the state that had the best voting laws for its citizens, no longer wanted them if their candidate was going to lose; they changed the laws, knowing this would adversely affect Native voters. The North Dakota state legislature continued to allow the use of Tribal IDs, but neglected to inform the Tribes and their members that this ID was not valid unless it had a physical address. Anyone familiar with Indian Country knows physical addresses don’t exist on most reservations, and for sure don’t exist on North Dakota reservations. These ID requirements were so restrictive that a large percentage of Natives could no longer vote. Also, if individuals forgot to bring their IDs to the polls, they had to drive miles back home to get their ID to vote. Needless to say, hundreds did not return, and their votes were suppressed. So, as a minority and also a member of a Tribal Sovereign Nation, I have seen how phony allegations, even when proven to be false, are still used as a tool to suppress the vote. Let this be a cautionary tale from Indian Country for the rest of the nation. Voting is not a right you should take for granted, especially now that Trump’s operatives are taking their campaign to disenfranchise voters nationwide. If, as a nation, we believe that a hundred guilty people should be set free to keep one innocent person from being convicted, we should not stand by and let hundreds of thousands of legal voters be barred from exercising their rights. It is more crucial than ever that we all protect the right to vote for all people. Even us Indians.